Single splice tape can be used with either paper or plastic tape, punched or formed pockets, any cover tape, and come in a variety of widths. They are primarily used in conjunction with either brass clips (K.BRS) or brass clips on lead frame (K.BRSLF) and their splicing tools respectively. 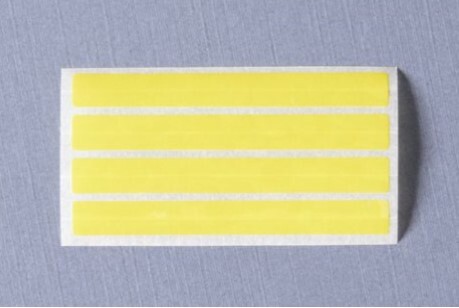 They can be used on the top cover tape, bottom cover tape, or formed pocket bottoms. Depending on the size, they come on removeable cards that have 1, 2, or 4 splices per card.